The Phat House is only minutes to the slopes so you’ll be deep in the pow in no time and we are centrally located in the Hakuba Valley (with as much terrain north of us as south) making it easy to access any or all of the 10 ski resorts in the valley. Ever had a dream? After chasing winters around the world this is ours: a tricked out lodge in the powder capital of the world. The seemingly endless powder was what brought us here and ultimately kept us here. We are called 'The Phat House' for a reason. 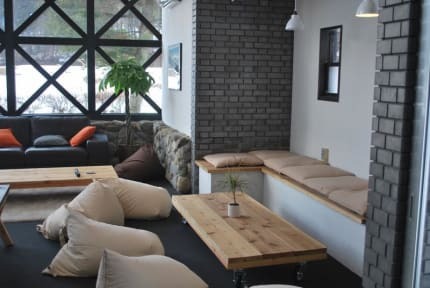 With wicked views front and back, comfortable rooms, a bar and restaurant, a backyard jib park, and an unparalleled focus on service we simply are the Phattest accommodation in Hakuba, Japan. We strive to impart our passion for the pow on you and will do our utmost to make sure you leave having had a killer of a time! 1).Check in time is after 2pm and check-out time is before 10am. 2).3 days advance notice for free cancellation. 3).We accept credit card(VISA, Mastercard, AMEX) and cash payment upon arrival. Could not be happier with the Phatty! Everyone is there to help and super friendly. Only a hop skip and a jump to Iwatake field and theres several shuttles to get you where you want to go. Amazing place and cant wait to get back there for another shred! Best hostel I’ve stayed at! All the staff are very friendly and always willing to help! They have complimentary pick ups and drop offs at the slopes and Hakuba station, which is extremely thoughtful. The atmosphere light and homely- suitable for all ages. If you want to have a couple of drinks and relax after a long day at the slopes, this is the hostel to stay at! One of, if not the best hostel I have had the pleasure of staying at. The service is next level, with complimentary shuttles to take your to a variety of boarding spots in Hakuba as well as some paid shuttles. Shuttle services are also provided in the evening for guest who wish to be dropped off around town. Staff are knowledgeable about the culture and the area and are more than willing to offer their advice on where to board/eat/drink. Food in the dinning room is also great! Had high expectations going into my stay due to the number of positive reviews and the Phat House didn’t disappoint, in fact it exceeded all expectations. The staff were very accomodating and the provided transfers meant you could get to the slopes or into town without any hassle. The facilities were clean, well-maintained and encouraged you to meet fellow travellers (all legends). It’s apparent Cam and co had decided to create the ‘ideal ski hostel’, and they absolutely succeeded! 10/10! I loved the phatty! It was perfect for a solo traveller to meet others. The house is very social with everyone telling their stories of the day. They also have shuttles to the different mountains. Absolutely amazing hostel- couldn’t fault it at all. Stayed in a shared dorm as a couple and wasn’t a problem at all. The staff were great and always happy to help. Great advice on restaurant tips, always willing to offer lifts etc. Lively atmosphere but never too much. Complimentary breakfast was a great touch too. Evening menu was great, and drinks very good value. Could not recommend this place any more. Every little detail had been thought of and it made for an amazing stay in hakuba! Modern building with excellent atmosphere and artwork. The staff were very friendly and helpful. Will book again when I come back to Hakuba! Highly recommend staying at the Phat House - the staff are incredible and go out of their way for their guests. Great transportation options, decent breakfast, shuttles at night and great atmosphere. Thanks to Cam, Matt and team! The Phat house is a fantastic place to stay. Great food, service and atmosphere . Excellent helpful staff. Comfortable beds. Being Aussie owned they should provide vegemite at breakfast. You won't be disappointed. I'll be back for sure. Absolutely epic place to stay. THe friendly, helpful and generous staff make this the place to be. Their morning to the snow, afternoon return from snow and evening to Happo shuttles are absolutely worth their weight in gold. The co-owners Matt and Cam went out of their way to make our stay comfortable, efficient and FUN! We even accidently left our snow jackets behind, and the team express couriered them to us at our next Japan snow resort free of charge and the jackets arrived in ~24 hours!! !